Typically, the executor can get the probate bond back. 2. Are Inherited Savings Bonds Taxable? 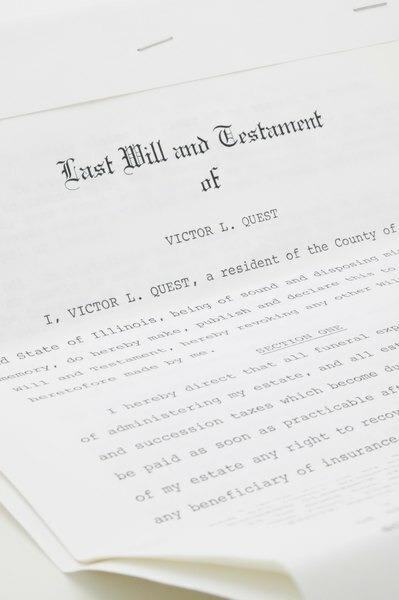 Probate bonds – also known as executor bonds, estate bonds and fiduciary bonds – are designed to protect the estate of the deceased from incompetence, fraud and other bad actions by the estate's executor. The executor posts the bond, and so long as he doesn't engage in any action that causes loss to the estate, the bond's principal will be returned to him when the estate is closed. Probate bonds vary in amounts depending on the estate's size, but the amount paid is a percentage of the bond, not all of it. Laws vary by state on who pays the bond fee, the executor or estate. As long as you behave ethically, you can expect to get the funds from a probate bond – excluding nonrefundable bond issuer fees – back upon closing the estate. Typically, when someone makes a will, he also names his executor in the will. If he doesn't, the probate court will appoint someone to act as executor. After the will's creator dies, the executor has many duties. He must find the will and give it to the probate court; assemble all of the deceased's property; pay any debts still owed by the deceased when he died; pay estate and property taxes; pay for any funeral arrangements made by the deceased; and, once the will is probated, distribute the deceased's property. In performing these duties, the executor must follow the deceased's intentions as expressed in the will. At all times during the probate process, the executor is subject to the supervision of the probate court. The law holds an executor to high standards of behavior. Executors have a fiduciary duty to the beneficiaries of the deceased's estate. A fiduciary must act in the estate's best interest, not their own. In short, the fiduciary must perform in an ethical and legal manner. Not only must the executor keep the deceased's assets entirely separate from his own, he must keep accurate accounting records and provide any accounting information requested by the beneficiaries. The executor's personal interests cannot conflict in any way with the interests of the estate and beneficiaries. If the executor's actions create such a conflict of interest, he has violated his fiduciary duty. The probate bond is designed to protect the estate and beneficiaries in the event that the executor fails to live up to his duties and obligations. The bond can give the estate's beneficiaries peace of mind, reassuring them that even if the executor somehow loses (or worse, makes off with) estate assets, they will be compensated. Sometimes the will itself will require the executor to post a bond. The probate court may also order the executor to post bond. But if neither of these circumstances apply, the estate may not need a probate bond at all. The will may also specifically state that the executor need not post a bond. The amount of the probate bond itself may vary depending on the size of the estate. The executor should theoretically get the entire amount of the bond back after the probate process is done, as long as he hasn't taken any action that harms the estate or the beneficiary's rights. Note, however, that if the executor doesn't have the money to post the probate bond himself, he must go through the services of a professional bond issuer or other lender. Potential executors should note that such issuers will generally charge a non-refundable fee for putting up the money. Ox Bonding: What Is an Executor Bond? Surety Solutions: How Much Does A Probate Bond Cost? FindLaw: Does Your Will Executor Need to Be Bonded? How Does a First Mortgage Bond Work? What Does Nontransferable Bonds Mean? Does an Executor Get a Percentage of Life Insurance Policies & Annuities?